TOMORROW’S world premiere of the Indian film, ‘Rajma Chawal’ at the London Film Festival will likely be only one of three occasions when the film can be seen on the big screen. Director Leena Yadav told www.asianculturevulture.com the film, which stars Bollywood legend, Rishi Kapoor, has been snapped by Netflix – but is hugely looking forward to the prospect of watching the film with a London audience tomorrow (Saturday, October 13 at Tottenham Court Road Cinema). She said that Kapoor, a firm Bollywood favourite – whom many will be disappointed not to see in the flesh in London – would make his presence felt all the same. “He is very much there in spirit and support,” she affirmed. 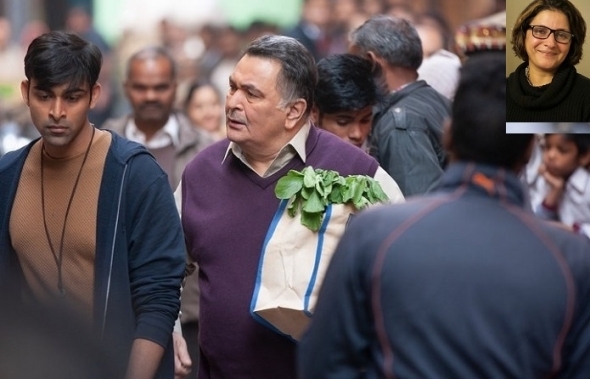 In ‘Rajma Chawal’, Kapoor plays a father looking to reconnect with his son following the death of his wife (and the son’s mother) and uses the medium of a ‘hijacked’ Facebook profile to do so. Yadav told acv: “He was perfect for the role and I learnt so much from him directing. He has worked with so many directors. “He has this amazing combination of wisdom and childlike surrender. Yadav said the film reflects a changing India – a generation of young people have grown up in the country with the same freedom and access to global digital platforms as their peers in the West – and popular dating apps have also changed some of the rules and etiquette around dating and relationships. She said the film should have an appeal to all age groups and was a strong love story. “There are funny situations, it’s a dramedy,” she told acv on the phone. She is one of the most high profile of woman directors in India. Her previous film ‘Parched’ premiered at the Toronto International Film Festival in 2016 and enjoyed huge critical acclaim and played to packed houses internationally, especially in France. It premiered in the UK at the London Indian Film Festival in 2016. Her husband Aseem Bajaj is a well-established cinematographer who worked on the recent India Netflix sensation, ‘Sacred Games’. he is the producer on ‘Rajma Chawal. “Yes, this is very different (to ‘Parched’) and focused on the men and their emotions,” she conceded. ACV asked her about the recent about the recent explosion of stories in India around the subject of sexual misconduct and #MeToo in the film industry in India. She welcomed those women who had come forward expressing injustices. She explained that the issue should not be “misused” and that those making allegations must do so knowing the full consequences of their very public remarks. “We should not dilute the essence of it (#MeToo) and people should come forward for the right reasons,” she reflected. She agreed that if too many accusations were found to be misleading or untruthful, it threatened to undermine those genuinely seeking justice and redress. She confirmed to acv that she was not looking for a cinema release in India. The film will be available from the streaming platform on November 30. •	8.20pm – Saturday, October 13 – Rajma Chawal, Tottenham Court Road Cinema, 30 Tottenham Court Road W1T 1 BX.